Efforts to tackle tobacco smuggling have been hampered by a "farcical" lack of action by the government and its agencies, a committee of MPs has said. The number of illicit cigarettes smoked in the UK rose by 49% to a billion in 2012, suggesting a reduction in enforcement action, the MPs said. The Commons home affairs select committee said the failure to deal with rogue products was "of grave concern". 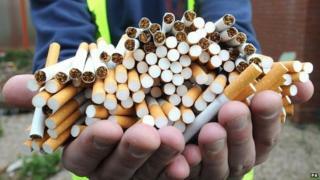 HM Revenue and Customs said tackling tobacco smuggling was "a priority". The committee was particularly critical of the failure to fine a single firm for deliberately oversupplying cigarettes to high-risk markets in order for them to be smuggled back to the UK. Taxpayers lose out on around £2bn in unpaid duty because of the illegal trade. "While there have been some high-profile successes, over the last three years the numbers of prosecutions and convictions for organised crime cases involving tobacco have fallen. "We do not believe that these numbers are decreasing due to the reduction in this type of crime and are deeply concerned that these figures may indicate a reduction in enforcement action," the cross-party group said. The committee went on: "It is astonishing that no UK tobacco manufacturer has ever been fined for oversupply of products to high-risk overseas markets and that only one statutory warning letter has been issued." The MPs welcomed efforts by HM Revenue and Customs (HMRC) and the Border Force to address acknowledged communication failures. However, they said more needed to be done to strengthen their joint strategy, which was introduced three years ago. The committee said: "The penalties available are too weak and enforcement too rare. "We find it farcical that a respected enforcement agency such as HMRC has not imposed tougher punishments on those over-supplying overseas markets. "We recommend that HMRC publish a clear set of criteria setting out the circumstances in which it would normally impose a fine and that an immediate review be taken against all historic and ongoing cases against this criteria in order to ensure those who have committed an offence do not go unpunished." The MPs also suggested that concerns over boosting the black market should not trump public health considerations in the debate over plain packaging. Meanwhile, HMRC said tackling tobacco smuggling was a priority. "Since 2000, we have more than halved the size of the illicit market in cigarettes," it said in a statement. The statement went on: "Since 2012, we have seized 3.3 billion cigarettes, over 800 tonnes of illicit hand-rolling tobacco and have prosecuted 593 criminals involved in the fraud. "We are determined to disrupt the criminal networks at the heart of this trade using every method available." Who are the 10 new 'tax fugitives' named by HMRC?